The ‘new’ iPad–or is it? If I were to put a photo of the iPad 2 in here as and proceed to tell you about the updated features you wouldn’t even be able to tell the difference. This is a good news to recent iPad 2 owners because they wont really feel bad about their latest purchase unless of course the prices drop which it will… eventually. The above photo (lifted from Engadget) sums up the display related improvements; That plus the iPhone 4S’ camera and a tad heavier and thicker body make up the ‘new’ in the announcement. As commenters had pointed out, if you were looking at an HDTV, an SD movie is hard on the eyes compared to an HD film… but for a 10” display would the additional resolution would it really matter? Siri is absent as well in place of whom is a dictation recognition which apparently works very well. There is an impact in app development here as well, when graphics were made before they just required double value to compensate for the iPad’s screen but with this new one, older apps not only need quadruple their resolution but the backgrounds will have to follow as well. 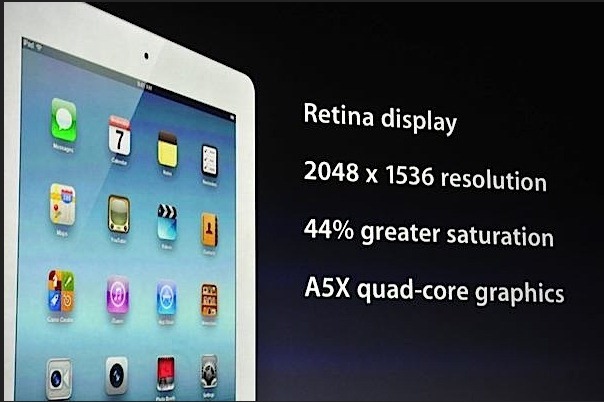 So will you be picking one up for the updated retina display with the same iOS 5? Only time will tell if this ‘new’ device will go the mile.